For those that appreciate a great steak, grilling it to perfection is an art. The days are getting longer and spring is around the corner. Here are some tips on how to cook the perfect steak on your Crown Verity barbeque when entertaining friends or family on those warm summer days. First step is to prepare your steak by lightly brushing olive oil on it. Marinade or add your favourite spices just before cooking and avoid salt as it can take away flavourful juices and dry out your steak. Preheat your Crown Verity barbeque and make sure the racks have been thoroughly scraped clean. Your total cook time will depend on the thickness of the cut of your steak. See the chart below for recommended cooking times. Check to see if your steaks are done by testing them with your finger or barbeque tongs. 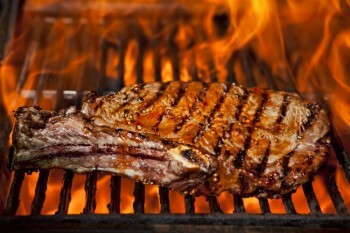 A rare steak will feel soft; medium should be firmer but springy; a well done steak will feel firm with no spring. Avoid cutting the steak to check for doneness as it will allow flavourful juices to escape. When selecting the best cuts of beef to cook on your Crown Verity barbeque, consider a porterhouse, T-bone, sirloin, rib eye or rump that is delicately marbled. Remember to let your steak sit for about five minutes after it’s done to retain all of its juices and flavour. This summer, enjoy the wonderful weather, time with friends and feel confident that you can barbeque your steaks to perfection…every time. Visit Appliance Scratch & Dent Outlet at www.scratchanddent.ca to view their full inventory of barbeques and barbeque accessories. And remember — happy grilling!